If you're a Windows 7 or 8.1 user, your PC is about to get a truly awesome upgrade. Windows 10 is launching on Wednesday, and it's everything a PC operating system should be: familiar, beautiful, easy to use and helpful in unexpected ways. The best part: it's a free upgrade for just about everyone currently running Windows 7 and 8. Microsoft (MSFT) took great pains to get Windows 10 right, opening up a preview version of the software to the public, asking for feedback and making dozens of changes as a result. That's why Microsoft is confident you'll love Windows 10. The company expects that 1 billion devices will run the new operating system in the next two or three years. The first thing you notice about Windows 10 is how familiar it looks. It has a desktop and taskbar filled with app icons and a Start button. Unlike Windows 8, there's virtually no learning curve -- anyone who has used a PC in the past decade will feel right at home. 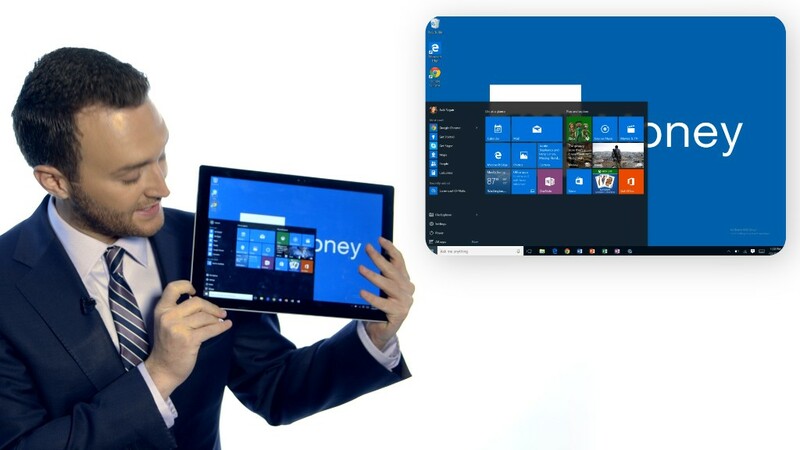 "That familiarity is critical," Windows chief Terry Myerson told CNNMoney. "We want millions of happy and engaged Windows customers." Windows 10 is noticeably prettier than previous versions of Windows. The icons, colors, backgrounds and lock screens appear modern and fresh. Even the system tray icons, including calendar, battery, volume and Wi-Fi, feel more inviting than in previous versions of Windows. But look a little closer, and you'll notice that Windows 10 isn't just a rehash of Windows 7 with a fresh coat of paint. It's much more refined. Though Windows 10 will be a cinch for PC users, it added some smartphone-like touches that make it even more useful than past versions of the operating system. For example, notifications and quick settings live in the new Action Center, a one-stop place to see who's emailed you, find app updates, adjust the brightness of your display, and all the other tasks you'd expect to find in an "action" tab. Think of it as Windows' version of swiping down on an Android home screen or a combination of swiping up or down on an iPhone home screen. Edge, the new default Internet browser in Windows 10, is slimmer and much more modern than its predecessor Internet Explorer. It even tries to save you from opening extra tabs by letting you perform Bing searches of words or locations with a quick right click. Do you run lots of programs at once? 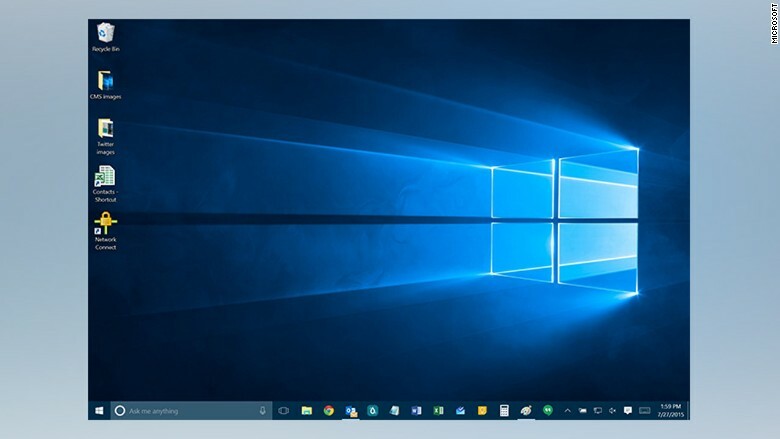 The Windows 10 desktop now lets you add lots of "virtual desktops," clearing away clutter Mac-style with the touch of a button on the task bar. But the biggest makeover went to the Start menu. 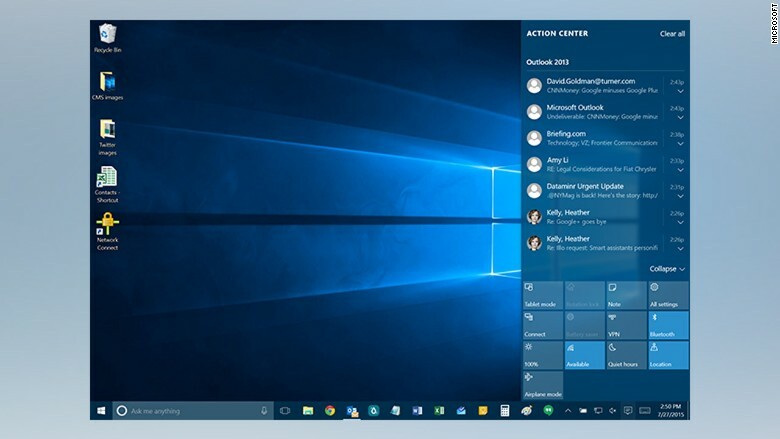 In addition to the expected Start menu features like power, apps and settings, the Start menu in Windows 10 also features a host of "Live Tiles" that made their (controversial) debut in Windows 8. Unlike Windows 8, the Live Tiles are unobtrusive in the Windows 10 Start Menu. They're actually a nice touch, letting you get quick glimpses at your upcoming calendar appointments, social media updates and even what's new on Netflix. But if you don't want them, you never need to interact with them -- Microsoft gives you a handful of Live Tiles to start with, but you can just send them all to the trash bin, for all Microsoft cares. Windows 10 gets to know you pretty well (if you let it). 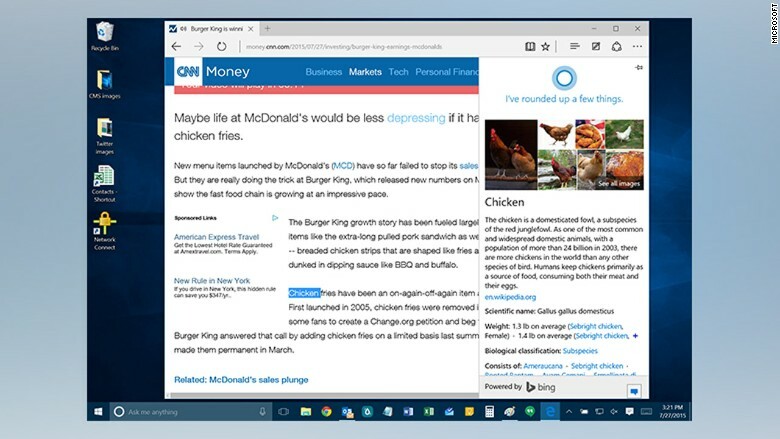 The search feature has become Cortana, your personal guide to your PC. 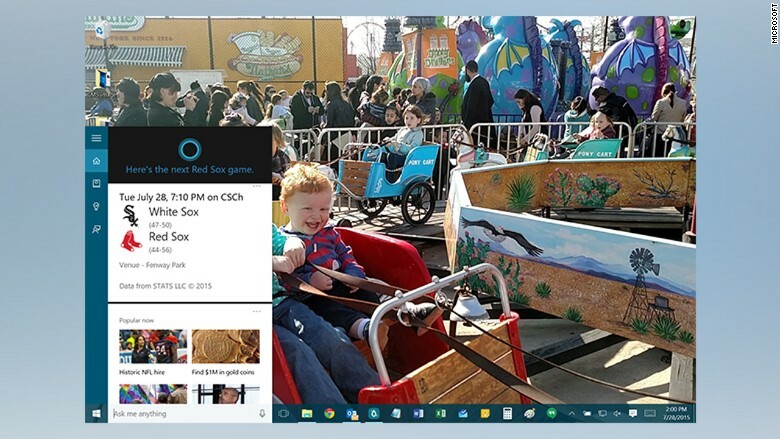 Cortana responds to voice commands, tells you when it's time to leave for your next appointment, and helps you find apps and useful information about your PC. Cortana also can get to know you and your habits the more you use it. Suggestions for movies, news stories and places to eat get better as you tell Cortana more about yourself. 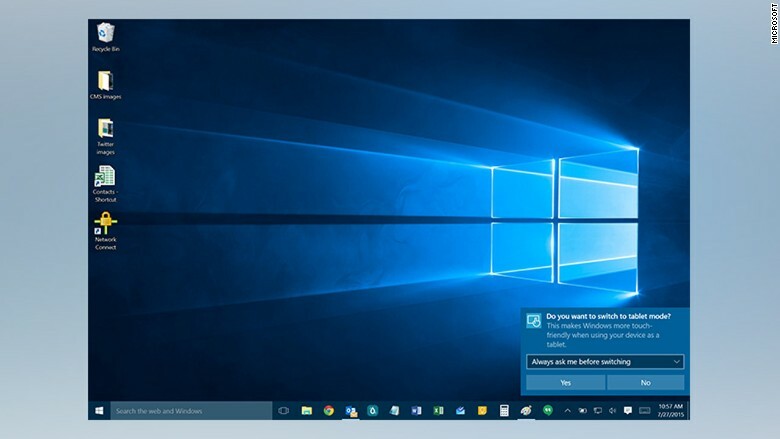 Windows 10 knows your PC pretty well too. If you have a "two-in-one" (a laptop that converts into a tablet), a new feature called Continuum will automatically adjust to make your screen more touch-friendly or keyboard-and-mouse-friendly, depending on whether you are using your gadget as a laptop or a tablet. And "Windows Hello" can learn your face -- and use your mugshot to log you into your computer, password-free. Microsoft has no plans to build a "Windows 11." 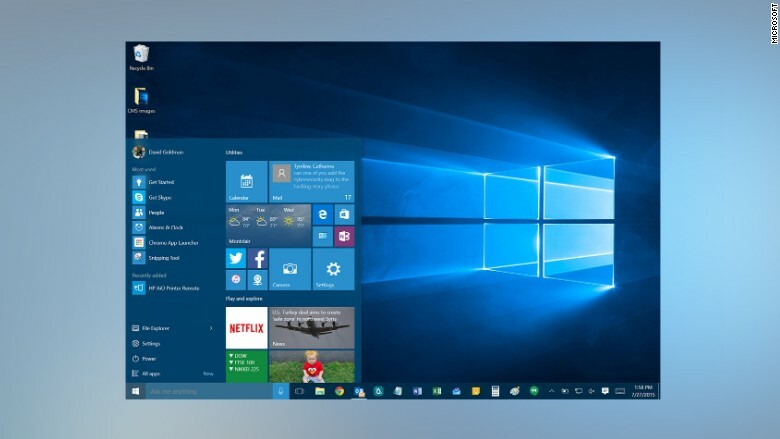 Windows 10 is the end of the line for the operating system. That's a good thing -- instead of waiting three years for an update, you'll get constant upgrades delivered through the Windows Update feature. Customers will be able to give Microsoft critiques through a new feedback app. And the goal is to get every single Windows app into the Windows Store so it can be rated by users. "Even applications like Notepad -- I hope that's in the store soon," said Myerson. "So we'll start getting ratings and reviews on Notepad. It's always humbling." Windows 10 is well worth a download. It's free, and it's much better than what you're using now. And if you don't love it, Microsoft wants to know so it can make Windows 10 better for you soon.